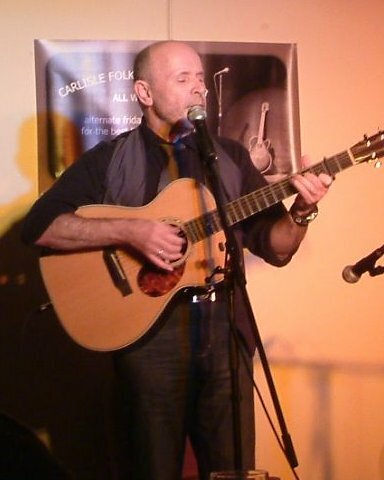 Phil Pipe is a highly original singer-songwriter with an eclectic collection of songs. These range from the poignant tale of a man obsessed with Rita Hayworth to the coincidences that bring lovers together and a whimsical description of a feline afterlife. His dry sense of a humour is aimed at the blues in French, a disastrous holiday romance and caffeine addiction. Phil also believes that the bits in between the songs are equally important and his introductions are as neat as his fingerpicking style. In 2012 Phil won the prestigious Hiring Fair at Cleckheaton Folk Festival and in 2013 he won the Comic Song Competition at Ingleton Folk Festival. Since then he has appeared at a number of clubs and festivals, from Music On the Marr in Cumbria to Mansfield Folk Club in Nottinghamshire. He has featured on Sheffield Live!’s Steel and Wire folk music programme and he has also been Tony Haynes’ guest performer on the Folk and Blues programme on Tempo FM. He has a CD, Lean On Me, and is currently working on a second album, for release in 2019. Phil lives in Melbourne (Yorkshire, not Australia) and he once sat next to Salvador Dali.